When updating or designing new production lines, your ROI and find ways to increase it is always a major consideration. Efficiency is a key factor to increasing your ROI. When companies have machines and employees that are working at maximum effectiveness they are able to maximize production. One great way to maximize efficiency is to implement machines that allow fewer workers to do more. These range from packaging machines, to pick and place robotics, to conveyors. Conveyors can increase product flow between machines and reduce worker injury from bending up and down to get product from under machines. With the use of conveyors and other machines, companies are able to maximize efficiency and reduce costs, increasing their ROI. Does the conveyor fit the application environment? Dorner offers conveyors for a wide variety of environments. Our 7X series is constructed using stainless steel and FDA approved belting options making it ideal for sanitary environments. It can easily be broken down for quick and thorough washdowns up to 100psi. Our aluminum frame conveyors are designed for industrial applications with many different lines to meet needs ranging from packaging to metalworking, to pharmaceutical environments. How much maintenance will the conveyor need? People often install conveyors and forget about them, and that the way it should be. No one wants to deal with constant belt tracking/tensioning issues. You should choose conveyors that have easy tensioning methods and reliable belt tracking. Dorner’s conveyors utilize a rack and pinion tensioning system that makes belt changes quick and easy. 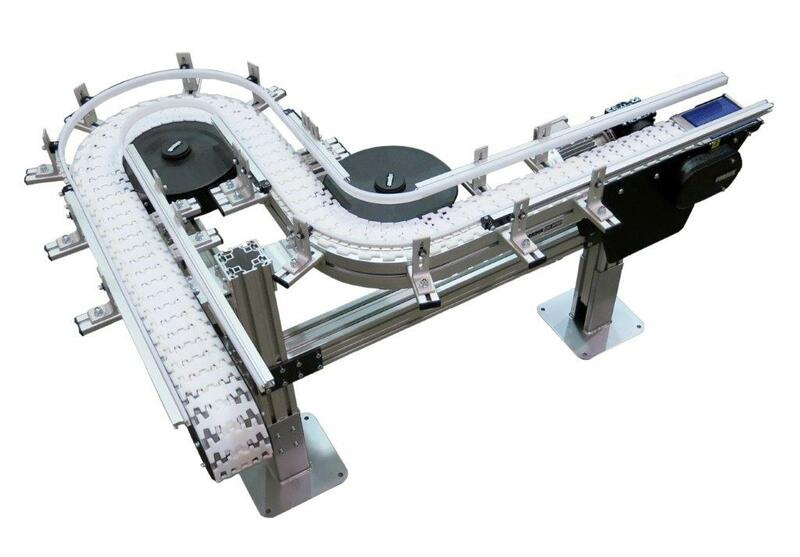 Our belt conveyors are also available with optional v-guiding to ensure proper belt tracking. How easily does the conveyor integrate with your other equipment? Many times conveyors are buried by other equipment around them. Dorner offers many features that make them easy to integrate with other machinery. Our conveyors are a low profile design making them easy to integrate. The low conveyor profile height makes them fit easily into other machines and in small spaces. They also have T-slots for mounting guiding and other accessories. Is the conveyor capable of handling your production needs? There are many factors that go into determining what conveyor is capable of handling your production needs. These include load capacity, speed, infeed and discharge methods, etc. Dorner’s online CAD configurator, DTools, allows people to configure entire conveyor systems and make sure that you’ve configured a system that will work for your application. All these things and more, when taken into consideration, can ensure that you get the conveyor your business needs. With the right equipment for your business, you can maximize ROI and ensure maximum production efficiency. Dorner can help ensure that your business gets the right conveyor for your application.